12 E-mail Rules Your Co-workers Should FollowEliminate The Muda! Many work environments today have found themselves reliant on e-mail as a primary form of communication. Some of us have seen guidelines or rules posted on the web or maybe even provided by our companies. Amazingly many individuals have apparently failed to read or heed these laws of the e-world. Some of what is listed here is for the sole purpose of helping you make more efficient use of the tools of your trade. Others items are directed at the boneheads that make everyone else’s life less efficient or more difficult because of their refusal to accept these rules. 1) Mail Rules – I once worked in a business where every product came with a manual filled with definitions, instructions, insights and user tips. Furthermore it directed customers to several additional sources of self-help resources. Routinely we would receive calls from customers asking for information that was within their reach. After politely helping the customer, our associates would routinely hang up then comment “RTFM” (Read The Freaking Manual). 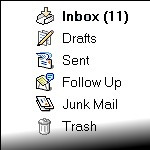 Auto File – Some systems will automatically file specified e-mails. Routine reports and common correspondence can be shifted into files of your choice ready for retrieval at your whim. Auto Delete – Delete e-mails with specific characteristics. My company supports many non-work related associate groups including religious, ethnic and gay and lesbian. I sincerely believe “to each his own”, but my feeling is that if it’s not work related I don’t want to see it. All of this gets tossed automatically. Auto Forwarding – Do you and your spouse routinely share things such electronic financial statement, trade confirmations or flight itineraries? Set your system to automatically forward these e-mails to your better half’s email account. 2) Auto Signature – Set up an automatic signature on your outbound e-mails. On the surface this is to make your life easier and limit unnecessary keystrokes. However, if done right this also helps your fellow associates and customers. Avoid the picture files and cute signature graphics. While it may look great on your screen these take up more bandwidth and slow down your customers system. More importantly many of these files may not even be viewable on your customer’s smart phone. Blackberries for instant will just reflect that there was an “image” but you cannot actually see it. Make it easier for others to contact you by simply leaving a text signature with your name, title, company (unless most emails are internal) and phone number. By doing so they will be visible on virtually every device and for many it will create an easily clickable link to your phone number. Limit the salutations. I’ve got co-workers that have 9 lines of information in their signature listing their titles, company, departments, cell, work, home, email and a quote that inspires them but may be a nuisance to others. The result? An e-mail thread that may have 7 lines of valuable information and several pages of salutations that must be printed or scrolled through. 3) No jokes, No quotes – Jokes are for good friends only! You may like them but that doesn’t mean others want to waste their time with it. Too many or the wrong ones for your sense of humor can be a irritant. Quotes if done right can be uplifting and inspirational. Done wrong they can also be an annoyance. If you must quote you better have a lot. Seeing the same one for days or weeks in a row is spammy. If you have a particularly deep quote you should understand what it really means. Recently I had a co-worker misinterpreted a quote written in early modern English and made himself look like a fool by using it incorrectly. 4) Use descriptive subject lines. The subject should be specific enough that a person can determine the content of the e-mail. Example: “Gas Allowance Question” is much more descriptive than “Question”. It makes it easier for search and provides the recipient the opportunity to plan how to prioritize e-mail without wasting time opening them all. 5) Update the Subject – The subject line should be representative of the current content in a thread of e-mails. If emails are being traded back and forth sometimes the subject changes as new questions or thoughts emerge. When the subject of the e-mail changes you should change the subject line accordingly. 6) Reply in the subject line – If you can and must reply using 5 words or less, put it in the subject line and end it with <EOM> (End of message). <EOM> signals the reader that there is nothing more of substance in the e-mail. There is no need to open it, you’re done. I love <EOM> messages. 7) ALL CAPS are ALL BAD – AFTER ALL THESE YEARS OF E-MAIL HOW DO SOME PEOPLE NOT KNOW THAT ALL CAPS IS LIKE YELLING! 8) Efficiency – Short and sweet is the best policy. Try to get your point across in 5 sentences or less. SOMETHING I AM STILL WORKING ON! 9) Use Templates – If you do a lot of repetitive work with e-mail, use templates. This is not the same as a form letter. Save yourself some time by setting up standard template formats that can be easily customized for the particular customer or need. Do you have a lot of customers asking the same questions? Provide a FAQ up front and save them the trouble. If your e-mail program doesn’t support template keep them in a text or WordPad file and copy and paste. 10) Avoid Reply All – You didn’t receive an email from “ALL” so in most cases it is not necessary to reply to “ALL”. If the originator asked for information or input from a group of 10 people that doesn’t mean that 10 people should be subject to all 10 replies. There are exceptions to this rule. In certain collaborative efforts where everyone in the group needs to be aware of the information, by all means, send it. 11) Limit attachment sizes – Even with broadband access, extremely large files can be very challenging. If you must send a very large file highlight the fact in the subject line – “Large Files Attached”. This way the recipient can make the best choice for their situation especially if working on a laptop with an air card or over a slower network. 12) Do you need to CC the CC? There are times when you may need to share information with a group to keep them in the loop, if so CC away. Then there are people that are trying to CYA when there is a problem or some friction. Others I call the “look-at-me” crowd, brownnoser’s that are always trying to be noticed by the boss or the boss’ boss. Whenever I see this I can’t help but recall those sunny afternoons on the grade school playground. These are the same kids that use to go tattle to the teacher for every miniscule infraction of the rules or brag because they went to the potty by themselves. These kids grew up and became your co-workers without learning that sometimes you need to just shut your mouth and handle your own conflicts. It’s sad to say in this day and age, people should know better. Unfortunately every item on this list was prompted by an e-mail that I have received in the last several weeks. I’m thinking a list like this needs to become a company policy or our countries law. What do you think? What ticks you off about how people use e-mail? Did I miss something? What rules would you add if you could develop a list of e-mail rules for your company? Lately, I am beginning to think I need to tattoo this on the arms of some co-workers!